Your local veterinary hospital for over 40 years. Call us to make an appointment today! We are ”The Clinic with a Heart. ” As pet owners ourselves, we strive to provide the best possible medicine and care. We are dedicated to ensuring a safe and comfortable experience for you and your pet. It means so much to us that you have chosen to become part of our extended family. Our goal is to improve and nurture the bond between you and your pet by supporting you in being the best pet owners you can be. 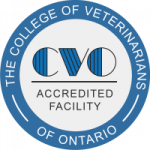 Established in 1970, the Bayview Mall Vet Clinic has been caring for pets in the community for over 40 years. We offer a range of services including medical, surgical and preventive health care needs for your pets so they live healthy, happy lives.